I have always taken terms like “native” and “exotic” for granted. Native species may be assigned ecological value, but it is what they reveal about our natural heritage that I have always valued more. As integral parts of my human experience, I treasure the idiosyncrasies of native species and the complexity of the communities they form. I value them for their beauty and the allegories their life histories provide for human experience. I have a particular and irrational soft spot for plants. What is different about exotic species? Why can’t I reconcile their growing ranks with the beauty and complexity I value? There are easy answers. Exotic species often lead to the simplification of communities and ecosystems by reducing local diversity. A clone of the exotic strain of reed grass (Phragmites australis) can expand across a species-rich wet meadow, replacing by its sheer size and extreme clonal spread dozens or even hundreds of species. Common buckthorn (Rhamnus cathartica) can so choke the understory of an oak woodland or oak opening that only a few of the most shade-tolerant herbs can exist. Common Reed crossing the road. Scientists and managers can and do document the ecological or economic harm that results, but there is also a toll on beauty. There is real harm done to the experience of enchantment one can have traversing a woods, prairie, or marsh. We cover more and more distance, seeing less, as landscapes are simplified. I care much more about this than I do any measure of ecological function or any dollar of economic impediment. There is much more going on here ecologically and aesthetically in this wet meadow of native plants than their is in a stand of common reed grass. However, not all species branded “exotic” are equally bad, and I’ve been wondering more and more lately if some might actually be harmless or even good. The species I mention above clearly deserve the brand, in addition to “invasive,” because they are not only present where once absent, but advancing, dominating, and simplifying vast areas. They also crossed an ocean, aided by humans, to get here, and their ability to behave as they do may result from their lack of recent co-evolutionary histories with native biota—there are many hypotheses about what causes invasiveness in exotic species, and I believe that all causes are probably true in cases. I will also note that when environmental conditions or disturbance regimes change, even native species can exhibit invasive tendencies, so it is also clear that any simple or consistent explanation here would be simplistic and meaningless. In other words, I think that any attempt to explain a lot in the field of Invasion Ecology is unlikely to scale down to the management of a case in a natural system. This brings me to where I stand now. I deal with plants in Wisconsin. There are many plant species that are native to North America or native to other parts of the Midwest that are considered exotic in Wisconsin, because they either arrived recently or because the early surveys did not detect them. In some cases, it is clear that a species is adventive from quite far away. 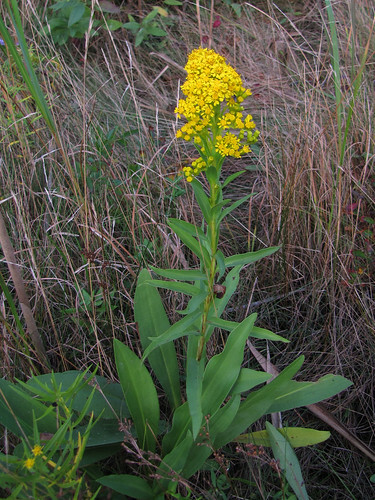 Seaside goldenrod (Solidago sempervirens) now occurs along our salted highways, having followed saline right-of-ways all the way from the Atlantic coast. In other cases, a species is considered native in Iowa, Michigan, Illinois, and/or Minnesota, having been detected in early botanical surveys. In those cases, should the political boundaries really dictate whether we label a plant “native” or “exotic?” Should we consider foxglove beardtongue (Penstemon digitalis) “exotic” in Kenosha County, Wisconsin when it is considered “native” in adjacent Lake County, Illinois? We do, and there are many species that follow this pattern…a source of unease for me as I apply labels to plants. Spiny naiad (Najas Marina) is considered a native plant of “special concern” (meaning it may become threatened or endangered) in Minnesota, but it is considered a “prohibited” exotic here in Wisconsin. What of the weeds? There are many weedy species that are clearly native to North America, but it is also clear that nobody has a clear grasp on what their original native ranges were. They have proliferated, because we’ve been digging, cultivating, and building across the landscape, but how much have their ranges truly expanded? Many of these species can exist for many years or decades in seed banks, so failures to detect them in early botanical surveys cannot tell us much. Many of them could have existed in prairies, ephemerally occupying bison wallows or gopher mounds, before we cut and turned over the whole thing. We find new populations of plants we consider to be native all the time, and some of these species are rather conspicuous. These may be new populations, but it seems at least as likely to me that early surveys simply didn’t detect them. This should give us pause. This crowfoot club-moss (Diphasiastrum digitatum) represented a new county record for Waukesha County when I came across it this fall. It is a conspicuous plant in all seasons and was located in an area that had received several botanical surveys in the last few decades. The colony was large and likely quite old. This, like most surveys, revealed several new populations of “native” plants for the natural area, township section, county, and/or SE Wisconsin. The situation is more complex than our terminology. Nonetheless, we need terminology to guide management and policy. So what do we do? How should we treat these species that are native at least somewhere in our region or to North America? Are they the same species introduced from other continents? I think we need to ask whether they pose threats to any of our natural species or communities beyond the threats of the environmental changes and human activities that are driving the range shifts in the first place. If we’ve created saline environments that a coastal goldenrod moves to occupy, is its appearance along our highways really so bad? There is no way to restore a natural community along the right-of-way so long as the salted highway exists. Perhaps a pragmatist could take solace in at least having a North American plant, con-generic with many native species and likely having some similar ecological interactions, present along the roadside. More generally, if a plant was absent from Wisconsin 150 years ago, but it has expanded its range into Wisconsin recently from adjacent states, states also with prairies, woodlands, and savannas not unlike those in Wisconsin and with many of the same species, does that really threaten Wisconsin’s remaining natural areas? One might argue that, without geographic barriers, if such species were likely to be invasive, they would have invaded Wisconsin prior to settlement, or it might have always been just a matter of time before they got here. Or, perhaps some of the species have been here all along, but we’ve failed to detect them. In an era of great anthropogenic change, including changes to climate, range shifts should not come as a great surprise, and range shifts are likely essential to the maintenance of biodiversity. We actually consider some species that barely managed to get a toe-hold northward into S. Wisconsin endangered (e.g. Echinacea pallida), which demonstrates how arbitrary this all is. What if one of the few S. Wisconsin Penstemon digitalis populations is native, and we’re calling it exotic rather than endangered when it basically shares its northern range limit with Echinacea pallida? Echinacea pallida reaches its extreme northern range limit in S. Wisconsin. It is considered Endangered in Wisconsin, but it is common on prairies just to the south in Illinois and Iowa. We apply different standards to animals. When a bird or mammal is spotted outside of its normal range in North America, we refrain from the exotic label. We get excited about it. Birds that expand their breeding northward are merely responding to climate change. Adult plants are sessile, but their propagules are capable of dispersal, and their movements are stigmatized for some reason. We need to adopt a nuanced view of plant distributions and recognize the shortcomings of our terminology in order to best conserve our North American flora now and in the future. I am not really sure yet what I mean by “nuanced,” but I am thinking about it. This entry was posted in native plants, restoration and tagged botany, ecology, exotic, invasive, native, natural area, plants, reconstruction, restoration, wildflowers, Wisconsin. Bookmark the permalink.